It’s been a great day, during which I’ve been fortunate to spend time with my two best mates in Tokyo. Whilst I’ve managed to get up at 6am every day this week, last night’s ridiculous experiment to see if I could run four operating systems at the same time on my old MacBook made sure that I had no chance of making it a full house. (Yes, it can run 4 at the same time. Very slowly). Still, I was up by 7am, met Tom on platform 2 at 7.30am – destination Tokyo Station. It wasn’t really planned, but we ended up jogging 15km (9 miles) around the emperor’s cabbage patch (otherwise known as the Imperial Palace). Having not exercised all week (mainly due to the cold in the mornings and my woosyness) I was a little sceptical as to my ability to complete the last lap – so as we entered the final 3km and my hips began to hurt, I just kept on telling myself that this was only the first lap, and I felt as fresh as a daisy that had just eaten a Freshness Burger. The result – a very strong finish! Back home, bath, then out to Shibuya for a lunchtime English lesson. That done, I headed south to Ebisu to meet Stu, my kiwi mate from the Niseko years. Having arrived a bit early, I sat on a step beside some coin lockers and played with some photos on my MacBook to pass the time. It was a boy in his early twenties. He looked Korean. Guide book in hand, he was probably on holiday. I was happy to have someone to talk to. We chatted for 15 minutes until Stu arrived. It was funny – when talking with Joe I found myself coming out with all the questions I ask my students on the phone (Ok, so I missed the one where I ask for directions to a fictional sushi shop). Nice guy. Reminded me of me on my first trip to Japan, except that I wasn’t in the army, and don’t like guns. Stu and I spent the best part of 4 hours talking, drinking coffee, eating ramen. It was good. Back home tonight I processed a few of the tilt shift shots I tried to take earlier in the week. 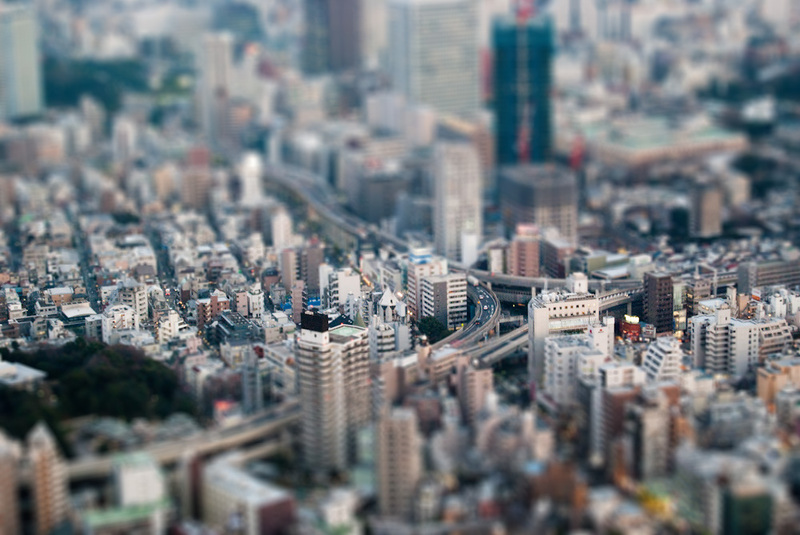 I’ve loved tiltshift photography (or more accurately, Tilt-shift minature facking) ever since I first saw some examples on NHK (TV), but have only recently learnt how it’s done. I find it fascinating how our brains can tricked into thinking that we are looking at a miniature scene by having an extremely shallow depth of focus. 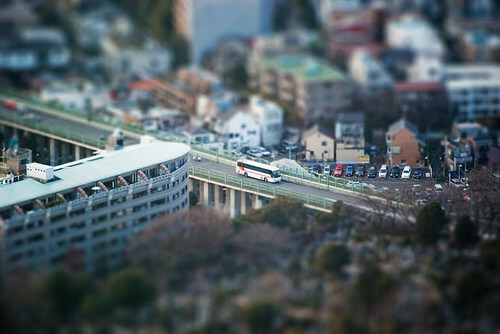 I’m now wondering though, if I look at enough Tiltshift photos, will their effect wear off on me, will my brain learn to associate them primarily with tiltshift and not miniature models? I guess I’ll just have to wait ten years and see. I thought that producing tiltshift photos would be relatively easy, and in a way it is, but producing really effective shots is difficult. The examples on this page are testament to that – they’re not very good. First off you need to find a good candidate out there in the wild. Then, you need to choose an appropriate depth of focus, and place it well. The latter two stages I find pretty challenging. Still, it’s early days, and I have a lifetime over which to improve. *Twinkle*s been busy today. She and a professional pâtissier hosted a Valentine’s Planning event, and, with a group of 15 or so friends who are also building Amway businesses, created a whole load of (what were apparently) delicious homemade chocolate delicacies. Unfortunately, no men were allowed entry. Our Amway business is doing pretty well. The worsening economy has resulted in a lot of people looking for the means to create a second or third income. With so many redundancies over the past few months it seems that the awareness of the importance of having multiple income streams is growing, and people are starting to look seriously at using their own skills and talents to build their own businesses. In some ways it’s not a bad time to start a new business, as a lot of companies that provide a poor service are going under, making way for new entrepreneurs who are determined to offer exceptional products / services. In addition to our full time jobs and our Amway business, *Twinkle* continues to do translation work, and I’m working on creating a new Internet-based media company, about which I don’t want to say too much at the moment. Let’s just say it’s at the cross-section of a lot of my passions – I’m very excited! It won’t make money for some time, but I see a lot of potential in it. I just have to Believe, and Act. More on that in due course. Anyways, it’s time for me to make a cup of tea.